The links below are for our year 2000 Fun Flys and other activities. Saturday, January 15th, 2000 - A truly WACKOS Day. Our first Winter Kite Workshop (click here for pictures), followed later by dinner at the Bayou Kitchen (pictures here). NOW! - A bunch of WACKOS April-foolin around with kites!! Saturday, 19th.Our second workshop was a big success. 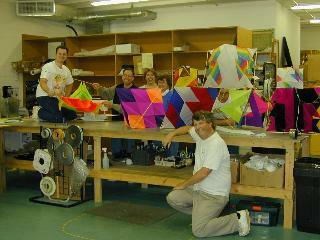 Below is a shot of the "workshoppers" and their completed kites.Click the picture for more pictures from the workshop. Got some good pictures of the Friday night balloon glow at Anderson, SC. They're here now - click here. Saturday, February 5th - There were a few of us that braved the chilly, but strong winds and filled the sky with some new kites. Jim's genki and banner tube, Marty's neon-rainbow delta and 9' windwheel, Franco's fleet of single lines, Reid's birthday fighter and Tony's flexi. There were some banners from the workshop and a new Pokemon banner. Those that wimped out because it was cold, missed a good flying day. Somebody said we needed some new pictures so here they are from Saturday, Sept. 16, our first fun fly of the cooler season. Click on the picture below to go to the page. You'll find out whose kite it is when you get there. Saturday, February 26th - The impromptu "cabin fever" fly at Frank Liske. Got a few pictures, click here to see. Finally! The guy with the digital camera got put to shame by the guy that took conventional pictures and had them on the net first. Oh, well, guess I'll have to take the lumps. Click on the logo above to see more pictures from the convention. March 3rd - 5th, Gone With the Wind Classic at Tybee Island, Ga. Click here to see the first pictures. At the convention, President-elect Dave Gomberg challenged each member present to sign up a new member by years end. Click the image at right to read about the WACKOS response to President Gomberg.